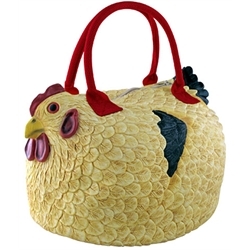 Today's giveaway is the "Henbag" Chicken Purse. THis handbag is the cutest thing! I would love to carry it and show off my love of chickens. THis might even entice me to carry a purse again! I feel I need to win this bag because my life cannot possibly be complete without a henbag purse! Love the handbag! I've been using the same darned backpack purse since I got married, just taking it to the cobbler every time it needs repair. I can sure use a new one, and this one is adorable! I wonder if my chickens will think it's a new addition to the flock? I am THIS CLOSE to getting some chickens. It's a crowded neighborhood so I am not sure how popular a move this might be. I have a rooster and it is dying to meet its future partner! I just love this purse! And since I am a country girl who lives in a small town - what better purse to have and carry, then a chicken purse! Everybody will see it and want to get one for themselves.